People have been talking about a baby CLS for quite some time now and after being caught testing in many times, the production version CLA-Class made its world debut at the 2013 Detroit Auto Show. Previewed by the Concept Style Coupe, the new CLA looks almost identical to the concept, but at the same time offers design elements that transform it into a "modern interpretation" of the CLS. The best feature of the new model is its aerodynamic-drag figure of just 0.23, that sets a new benchmark among not only Mercedes models, but also all series-production vehicles. The model is also equipped with tons of technology that will transform each ride into a secure journey. In the U.S. market Mercedes will only bring one version — the CLA250 — and sales will begin in the fall of 2013. Updated 02/06/2013: We have just stumbled across a leaked file from Mercedes-Benz that everyone may be interested in. This new file is the U.S. 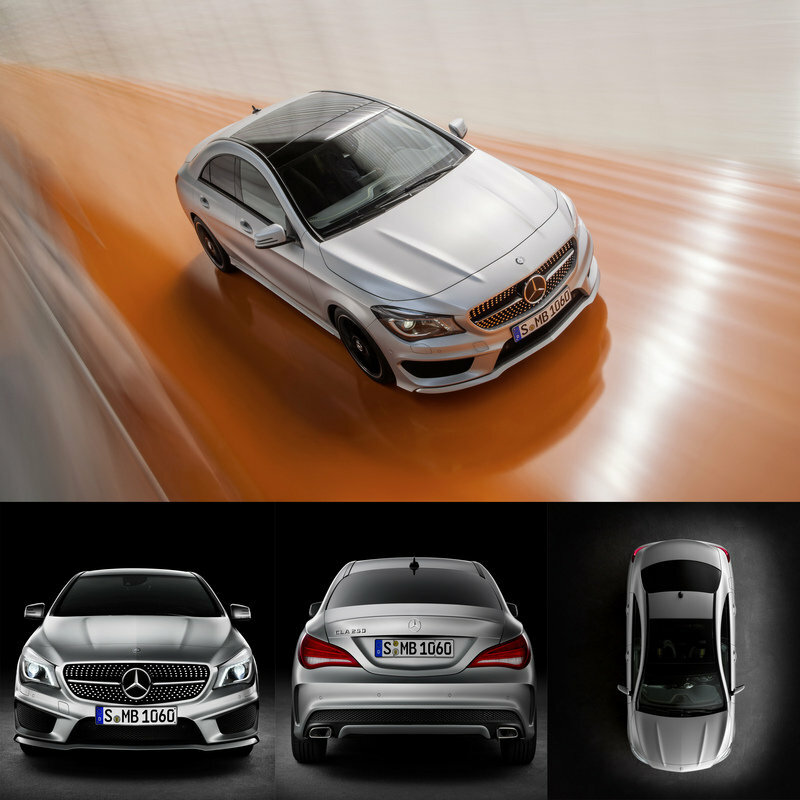 Ordering Guide for the 2014 CLA-Class. You can find the guide after the jump. Updated 07/01/2013: Mercedes placed an online configurator for the new CLA250 Coupe which will go on sale this fall. Go online and play with the exterior and interior colors, wheels and options! Additionally, we have updated this review with all of the new details that the configurator unveiled. 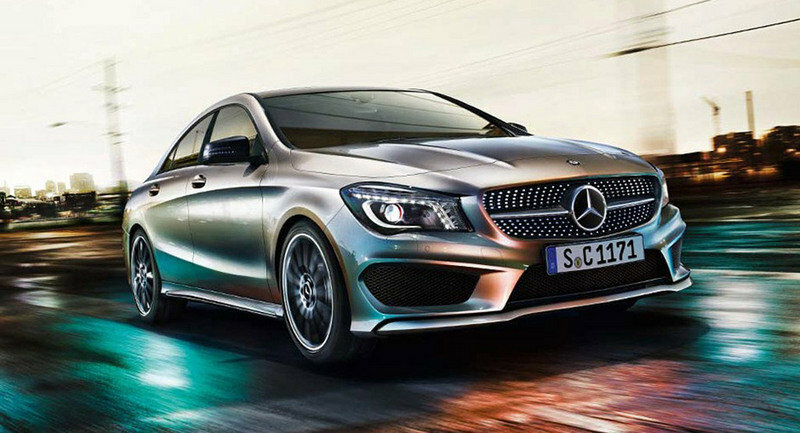 The new Mercedes CLA features design elements we have already seen in the Concept Style Coupe. In fact, to be completely honest, the production version is almost identical to the concept. The most striking features are the bonnet with power domes and the diamond-pattern radiator grille, and the new headlamps with LED lights arranged in such a way as to create the characteristic "flare effect." Many people have called the new CLA a "baby CLS," but according to Mercedes it is "a further development of the modern classic Mercedes-Benz CLS.” The model is highlighted by three prominent lines — one up front flowing towards the rear end in a characteristic dropping line, a second one spanning the shoulder muscle above the rear axle, and a third one extending in a sweeping curve from the front wheel towards the rear. 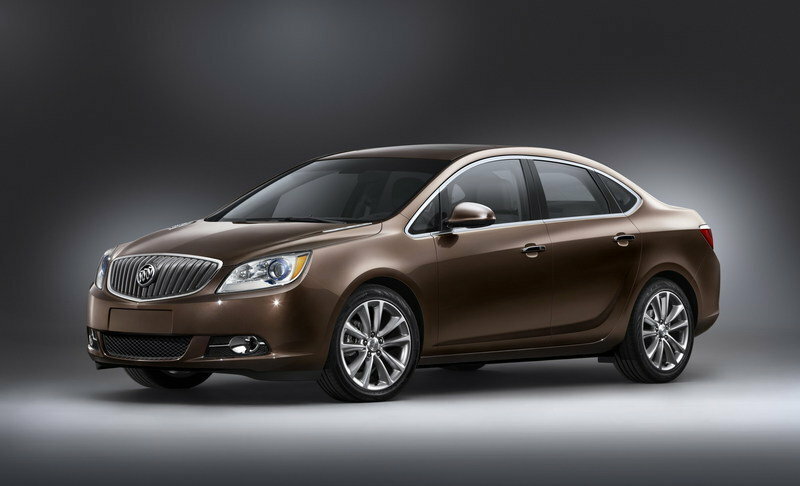 The model has also received a sloping roof line that offers it a coupe-style character. At the rear, the taillights also feature a new design and are framed by the muscular lines of the shoulders which extend into the rear end. For a little extra aggression, buyers can pay an extra $2,000 for the Sport Package, which adds in an aggressive front apron with larger mesh air intakes, sculpted side sills, a deep rear valance with textured black insets, a chrome diamond-block grille, 18-inch AMG twin-5-spoke lightweight wheels and painted calipers. 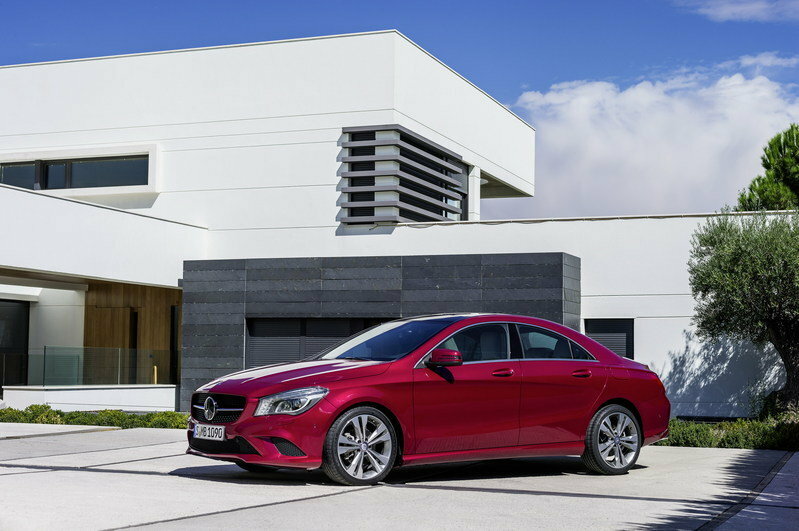 The exterior is focused on a sporty appearance, but the interior Mercedes focused on luxury, as the new CLA combines high-quality materials with all the latest technologies. There are five round vents on the instrument panel and the free-standing display screen features a black piano-lacquer-look front panel and a flush-fitting silver frame. The CLA is offered with integral seats on both front and rear, with the rear ones offered a 2+1 configuration. 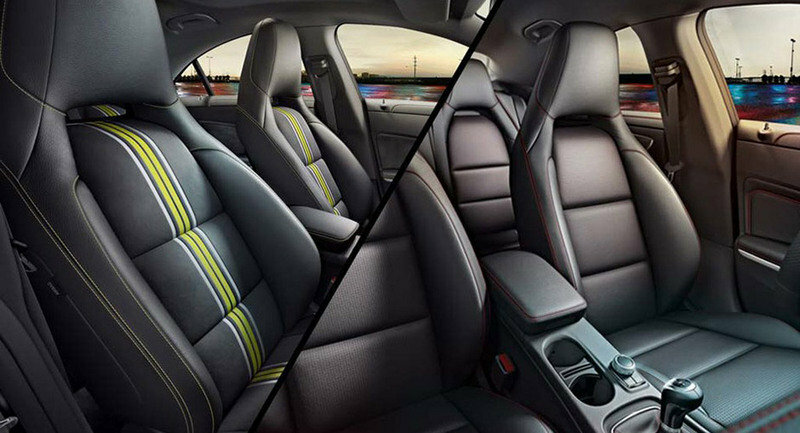 The seats can be ordered in a wide choice of materials and colors, with colored contrasting stitching available, according to the selected interior appointment options. For buyers looking for some extra luxury, Mercedes has the Premium Package. This package adds $2,200 to the cost of the CLA and includes: in dual-zone automatic climate control; heated front seats; a 450-watt harman/kardon LOGIC7 Dolby Digital 5.1 sound system; Media Interface to connect your iPod to the CLA; an Auto-dimming driver-side and inside rear view mirrors, compass display in inside mirror and an integrated garage door opener. For the tech savvy buyer, Mercedes offers the Multimedia Package comes in at $2,370 and it includes: a review camera; enhanced voice control; 80 GB hard-drive-based navigation with a 7-inch display; an in-dash six-disc DVD/CD player and an SD card reader; 10 GB of music and video storage; and SiriusXM Traffic and Weather. The Interior Package adds $1,500 to the CLA’s price, but it does require the addition of the Premium Package for a net increase of $3,700 in the base CLA price. This package will likely be the most popular of the group, as it adds in supple leather seating, infrared-remote window control and MB-Tex upper dash and door trim covering. 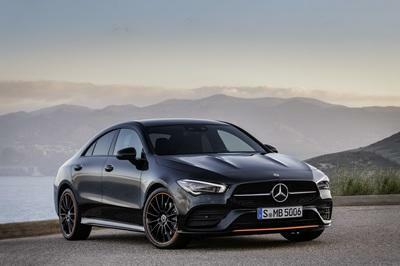 American customers will only get a CLA250 version, a model powered by a 2.0-liter four-cylinder gasoline engine that delivers a total of 208 horsepower and 258 pound-feet of torque. It comes with the ECO stop/start function standard for added gas mileage and is mated to the seven-speed Dual Clutch Transmission. This engine can be combined with a 4MATIC permanent all-wheel-drive system in the CLA250 4MATIC version. This system includes power take-off to the rear axle, which is integrated into the seven-speed Dual Clutch Transmission, and the rear-axle gear set with an integrated electro-hydraulic, multi-disc clutch. This setup enables fully variable distribution of drive between the front and rear axles. Mercedes has equipped the new CLA with a McPherson strut suspension at the front and independent multilink suspension at the rear. The multilink suspensions includes three control arms and one trailing arm at each of the rear wheels to allow longitudinal and transverse forces to be handled separately. As standard, the CLA also offers electromechanical power steering that offers improved driver feedback and makes an important contribution to overall efficiency. The model comes with standard 17-inch five-spoke, two-tone wheels clad in all-season, run-flat tires, while the optional Sport Package offers 18-inch AMG twin five-spoke wheels. In a Super Bowl commercial, Mercedes-Benz released the official base price for the new CLA-Class. The only model available in the U.S.market to date is the CLA250, which comes in at $29,900 plus a $925 delivery fee. Mercedes has released the official dealership ordering brochure and it somehow made its way online. This outlines all of the features and options for the upcoming CLA-Class, so dealerships can pick and choose what they want to stock their showrooms with. Click here to see the U.S. Buying Guide. In the US market, the 2014 Mercedes CLA will have to take on models like A3 or Verano. The problem is that in this case it would be pretty difficult to choose our favorite. In most cases the Audi models would make it to the top of the list, but the Verano also proved itself as a pretty impressive competitor, not to mention that the new CLA has already stolen the hearts on many people. 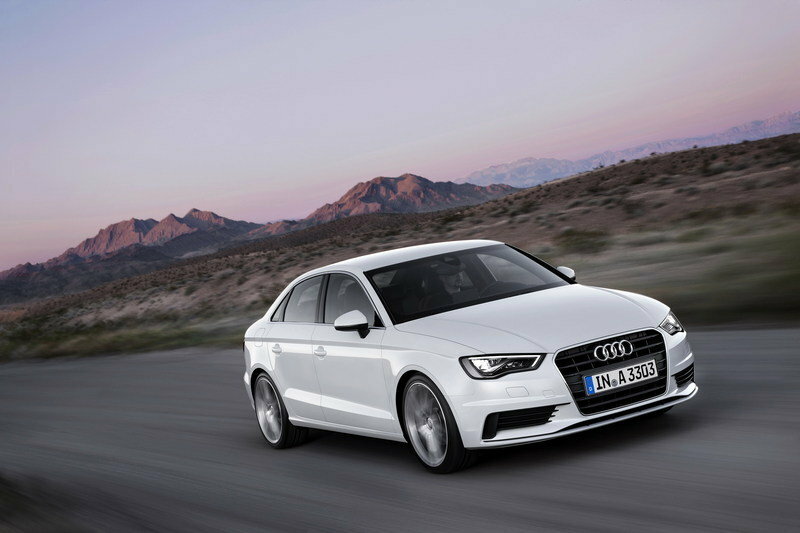 The Audi A3 sedan will be offered with a 1.8-liter TFSI gasoline engine that delivers a total of 180 horsepower and 184 pound-feet of torque and will go on sale by the end of 2013. Verano is offered with an Ecotec 2.4-liter four-cylinder engine that delivers a total of 177 horsepower and 170 pound-feet of torque - a little less powerful than the CLA, but customers can also opt for the Turbo version and enjoy an output of 250 horsepower. In the end, the CLA is exactly what Mercedes needed in the U.S. market. 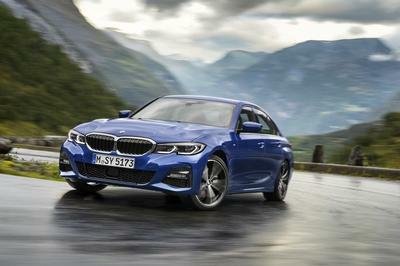 It offers customers a coupe-styled sedan with decent performance for under $30k. Sure, it is barely under that mark, but it is still 8under it. Sure, there are some issues that we have with this new four-door coupe, including the standard MB-Tex (glorified vinyl). Ultimately, however, the CLA-Class is a refreshing change for Benz and gives customers an option other than the aging C-Class. 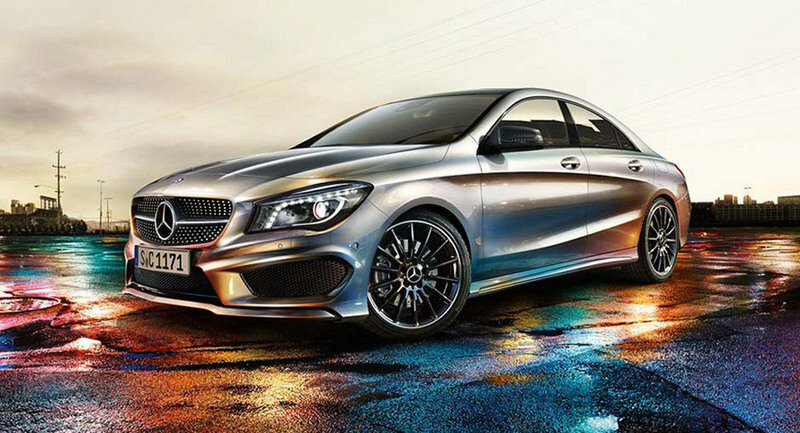 Mercedes-Benz is expanding its lineup with the all-new 2014 CLA-Class. The new four-door coupe is a style rebel that takes its design cues from the CLS, whose design concept has inspired more than its fair share of imitators since its debut in Detroit in 2003. This brand new vehicle features world-leading aerodynamics, avant-garde coupe design and is available with 4MATIC all-wheel drive (Spring 2014). With its frameless doors, the four-door coupe seamlessly carries the design of the Concept Style Coupe into series production. The new model features COLLISION PREVENTION ASSIST as a standard feature. At speeds above 4 mph, this radar-based braking system is able to warn the driver of obstacles and to anticipate braking force when the driver steps on the brake pedal. 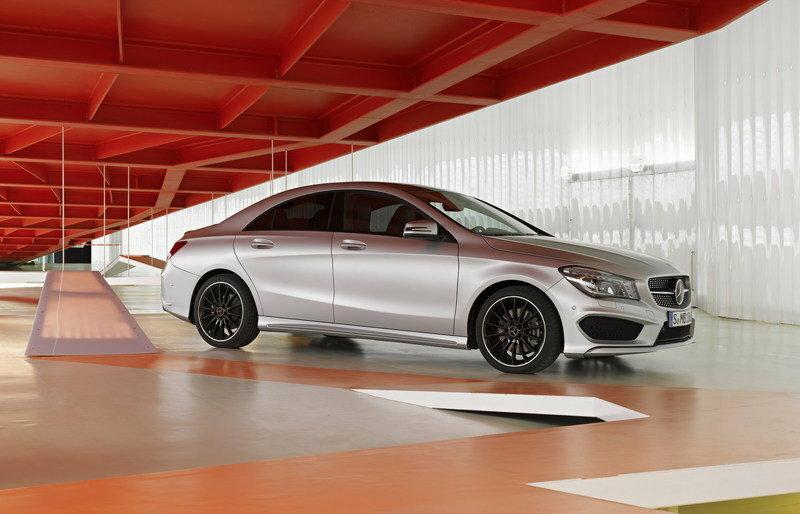 The all-new 2014 CLA250 arrives in U.S. dealerships Fall 2013. 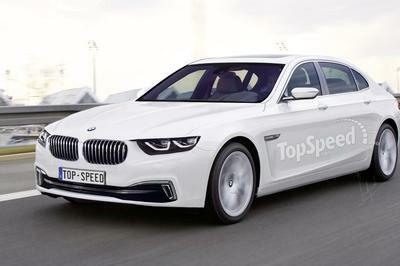 "The response to the Concept Style Coupe was overwhelming. The most frequent comment by far was ’Please put this car into series production.’ That’s precisely what we are doing now," notes Dr Dieter Zetsche, Chairman of the Board of Management for Daimler AG and Head of Mercedes-Benz Cars. "The CLA is a car that does not confuse ’mid-size’ with ’mid-quality’. Its sporty design underscores the sporty side of the Mercedes-Benz brand." The sporty CLA comes with a powerful turbocharged engine generating 208 hp and 258 lb-ft of torque, as well as sport suspension and available 4MATIC allwheel drive. The technical highlights of this new design icon include a new world record in aerodynamics for series production automobiles (Cd value: 0.23) and a wide range of driver assistance systems, including advanced COLLISION PREVENTION ASSIST. This radar-based assistance system provides the driver with visual and acoustic warnings of identified obstacles and primes Brake Assist for adaptive braking. Brake Assist is initiated as soon as the driver steps hard on the brake pedal. When the system identifies a risk of collision, COLLISION PREVENTION ASSIST calculates the precise braking force ideally needed to avoid an accident and makes the best possible use of any distance remaining. Adaptive Braking Assist activates at speeds of just 4 mph and gives trailing vehicles as much time as possible to also react accordingly and avoid another accident. There are four special equipment packages and a series of standalone options for individualizing the striking compact four-door coupe (length/width/height: 182.3/80.0/56.6 inches). In keeping with the digital lifestyle of the CLA’s social media-savvy target group, smartphones can also be fully integrated into the vehicle’s display and operating system via mbrace2, which is standard equipment. 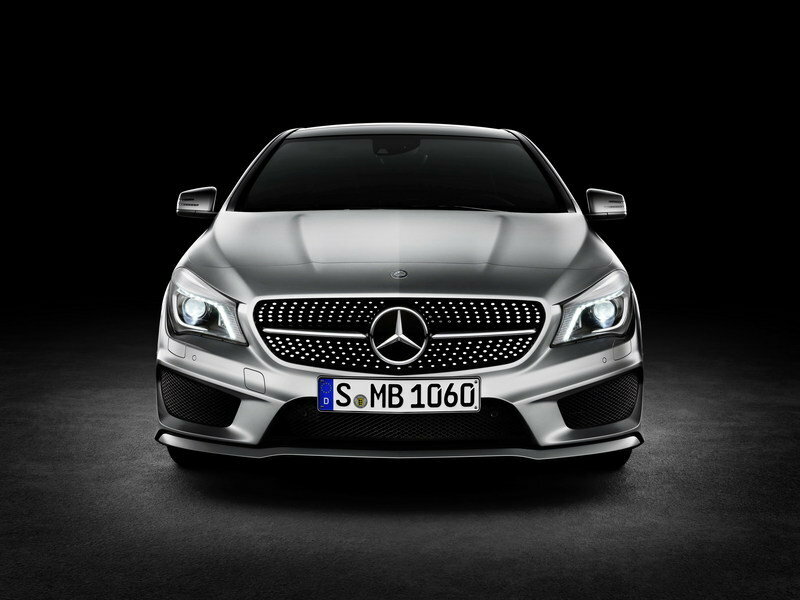 Following a brief appearance on the eve of the North American International Auto Show in Detroit, the CLA will celebrate its official world premiere at the Mercedes-Benz Fashion Week in Berlin (January 15 to 18, 2013). The new CLA will arrive at U.S. dealerships in September 2013. 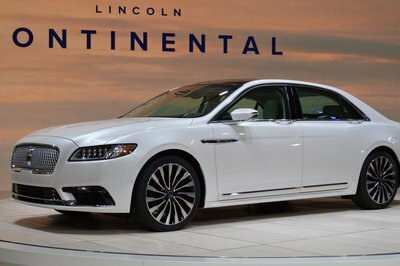 Its sporty proportions and powerfully dynamic design language featuring the interaction of concave and convex surfaces give this four-door coupe its distinctive look. The CLA carries the avant-garde design of the Concept Style Coupe into series production almost 1:1. Striking features include the hood with its power domes and the diamond-look grille. The arrangement of the headlights and LEDs behind the headlamp lens evokes the characteristic "flame effect" for the optional daytime running lights and indicators. This light signature is a key aspect of the car’s energetic look and shapes a new, youthful Mercedes face. A number of details indicate that the design of the CLA represents a further development of the modern classic Mercedes-Benz CLS. Three prominent lines give structure to the vehicle when viewed from the side - the front structural edge above the fenders flows toward the rear in a characteristic dropping line. Another, more sinewy line spans the shoulder muscle above the rear axle, while the third feature line extends in a sweeping curve from the front wheel toward the rear. Together, these lines lend depth and dynamism to the side profile. 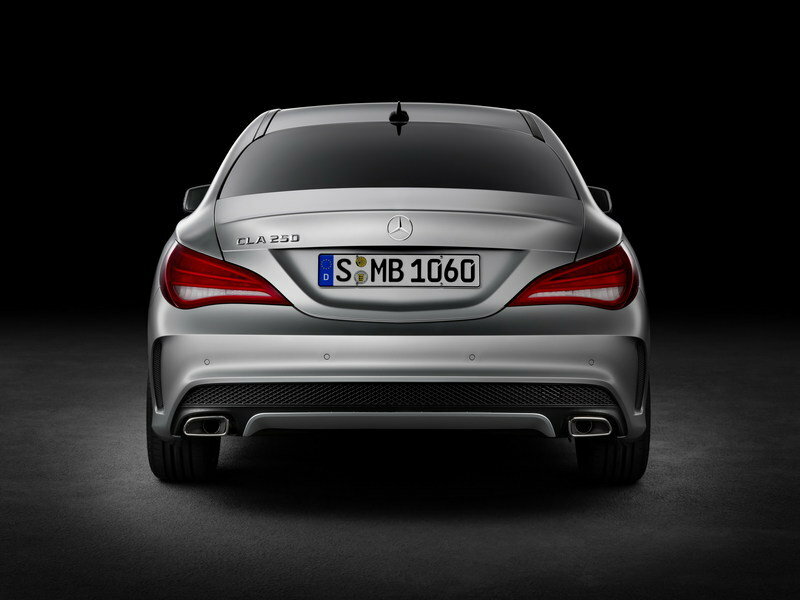 The design of the rear end emphasizes the width of the CLA, expressing power and athleticism with the interaction of convex and concave surfaces and edges. 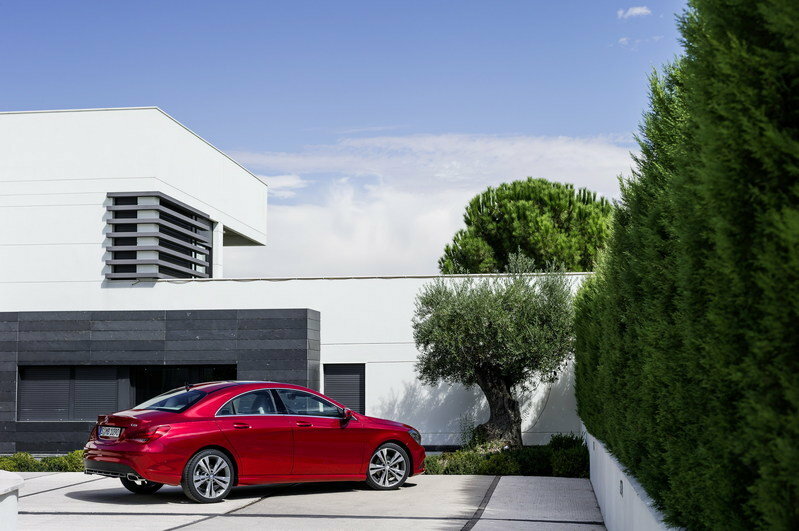 The gently sloping roof contour and pronounced curve of the rear window retain the CLA’s coupe-style character. The athletic look of the rear end comes from the drawn-in C-pillars paired with the shoulder muscle above the rear wheel arches. The tail lights are framed by the muscular shoulder lines extending into the back while the horizontal light layout emphasizes the car’s powerful and visually striking breadth. A large panorama sunroof is available as a standalone option. It consists of a fixed polycarbonate cover at the front, a glass moving panel and side trim elements to match the glass look. The visual effect is of a glass surface that extends all the way from the front to the rear windshield. 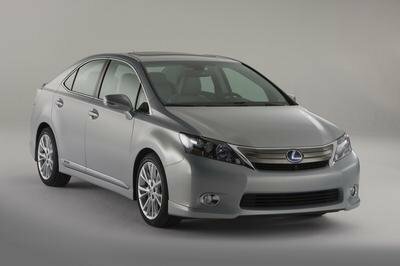 The exterior’s progressive, sporty appearance also carries through to the vehicle interior. Anthracite surface finish is available as the standard trim. Additional trim options include burl walnut wood, black ash wood and aluminum. The instrument panel incorporates five air vents. The outer rings of the vents are done in a high-quality galvanized finish, while a galvanized insert controls the direction of airflow. The free-standing display is set in black piano-lacquer trim and edged with a flush-fitting silver frame. With a Cd figure of 0.23, the CLA sets a new benchmark among not only Mercedes models, but also all series-production vehicles. The frontal surface area, Cd x A - which is crucial to aerodynamic resistance – also leads the field at 5.49 sq. ft.
An extensive array of standard and optional driver assistance systems in the CLA is available to the driver. Standard features include ATTENTION ASSIST drowsiness detection and radar-based COLLISION PREVENTION ASSIST with adaptive Brake Assist, which offers collision protection in the CLA from speeds of just 4 mph. The optional Driver Assistance package also offers DISTRONIC, as well as familiar safety systems including Blind Spot Assist and Lane Keeping Assist. PARKTRONIC with Advance Parking Assist enables autonomous parking in parallel and perpendicular parking spaces and is available as a standalone option. The CLA’s running gear features McPherson strut suspension at the front and independent multilink suspension at the rear. Three control arms and one trailing arm at each of the rear wheels enable longitudinal and transverse forces to be handled separately. Specific to the CLA is the flexible decoupling of the rear axle sub-frame for improved ride characteristics. The wheel mounts and spring guides are made from aluminum in order to reduce unsprung masses. Standard equipment includes the Mercedes-Benz Sport Suspension for sporty yet comfortable handling. The CLA also comes as standard with electromechanical power steering. Compared with conventional systems, this power steering system offers improved driver feedback and makes an important contribution to overall efficiency, as the power steering function draws energy only under active steering. It also facilitates various steering assistance functions activated by the ESP® control unit. These include counter-steering in the event of oversteer, corrective steering when braking on road surfaces with differing levels of grip (split-friction braking), minimization of torque steer and compensation for crosswinds and road gradients. 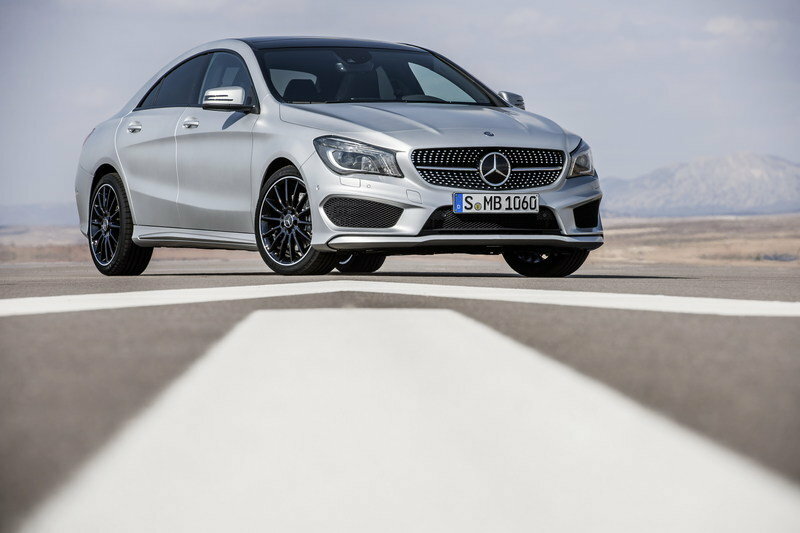 Both the front wheel drive and 4MATIC variants of the CLA250 are delivered on 17-inch, 5-spoke, two-tone wheels clad in all-season, run-flat tires. The Sport Package offers 18-inch AMG twin 5-spoke wheels and adds Sport body styling plus perforated front discs. The Mercedes-Benz CLA250 is also available with a new generation of the 4MATIC permanent all-wheel drive system featuring fully variable torque distribution. Like the other 4MATIC variants, this completely new development boasts high levels of traction and outstanding agility combined with excellent safety and energy efficiency. The components of the new 4MATIC include the power take-off to the rear axle, which is integrated into the 7-speed Dual Clutch Transmission, and the rear-axle gear set with an integrated electro-hydraulic, multi-disc clutch. This set-up enables fully variable distribution of drive between the front and rear axles. Additional benefits of this design are a lower system weight than that of competitor systems, as well as a high degree of efficiency. The CLA250 and CLA250 4MATIC both feature Mercedes-Benz’s 2.0-liter fourcylinder gasoline engine with 208 hp and 258 lb-ft of torque. It comes with the ECO stop/start function as standard for added gas mileage and is mated to the 7-speed Dual Clutch Transmission for an outstanding combination of sporty performance and comfort. The latest generation of multimedia systems in the CLA provides a wide array of functions, apps and graphics. Like all models in the Mercedes-Benz lineup, the CLA comes with the brand’s acclaimed connectivity service mbrace2, providing users with an extensive range of online and concierge services and apps all linking seamlessly to smartphones for use inside and outside the car. By using cloud technology, mbrace2 is always up to date and offers users wide-ranging and flexible access to content. The CLA250 and CLA250 4MATIC both include the 5.8-inch display and Bluetooth as standard equipment. The central controller provides an all-access pass to an abundance of advanced technology. This can be upgraded to the 7- inch display with the Multimedia package featuring the COMAND system with hard-drive navigation, voice control, an SD card slot, an in-dash 6-disc CD/DVD changer, a 10GB music register, a rearview camera and SiriusXM Traffic & Weather. As well as the Multimedia package and Driver Assistance package, the CLA250 and CLA250 4MATIC are also available with the Premium package for an even higher level of comfort and convenience. Its features include an iPod/MP3 media interface, SiriusXM satellite radio, the harman/kardon LOGIC 7 surround sound system, heated front seats, auto dimming mirrors, integrated garage door opener, dual-zone climate control and a compass.